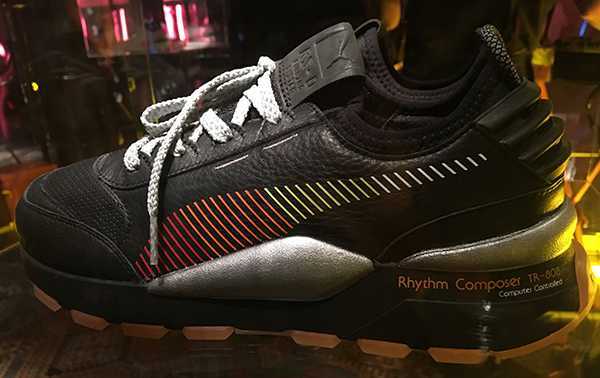 Shoe manufacturers Puma have just teamed up with the people at Roland for a new TR-808 inspired sneaker line. The line will be available for consumers to purchase and are a new color scheme for the re-launch of the Puma RS shoe line. The RS (Running System) line is a reboot of the 1980s original, so what better way to make it even more 80s than have a color scheme inspired by what is likely the most popular 80s drum machine ever. To capitalize on 80s nostalgia, Puma went to Polaroid, Roland, and Sega for special looks for the shoes. Sadly, you don’t get any special drum machines sneakers. What you do get is a slick-but-subtle black color scheme, with accents taken from the drum machine and a nod on the heel to the front panel label on the original. No word of when the sneakers will be available and for how much.